Few things are as American as the Super Bowl. In fact, it’s surprising the Monday after the game isn’t a national holiday! This year the big game is happening on Sunday, February 3, when the Los Angeles Rams will face off against the New England Patriots. 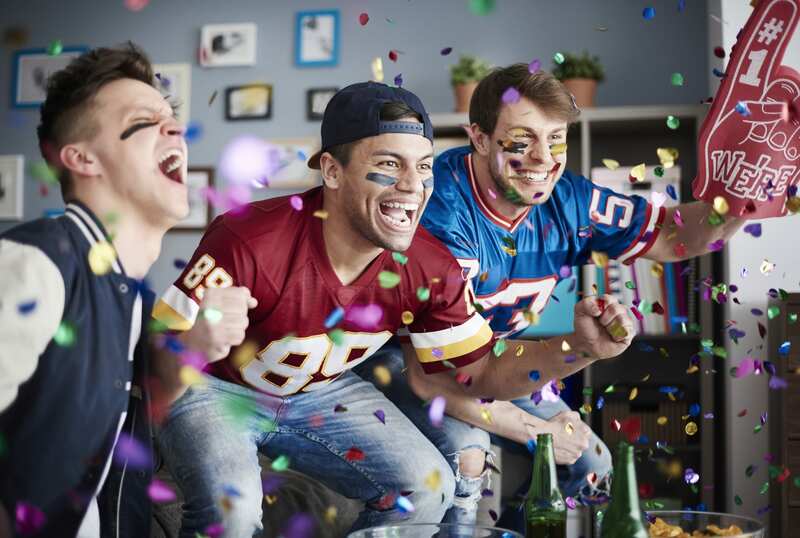 Whether you’re a die-hard football fan or just in the mood to throw a party, you can host a fun fete for Super Bowl LIII without spending a fortune. Here’s how to do it. SEE ALSO: 6 Best Buys for February — It’s More Than Presidents’ Day Deals! With bulk purchasing, you’ll typically pay a lower price per unit than you would when buying in limited quantities. So if you’re going to throw a big party, consider buying in bulk at Costco, Walmart, or BJ’s Wholesale Club. And don’t forget online retailers like Amazon, too. Just remember to compare prices to make sure you’re saving money on each unit, and stick to items you’re actually going to use. When buying Super Bowl party food, you can save money with the help of free apps like Ibotta and Checkout 51. “Both of these apps offer discounts on certain products at grocery stores,” says Marc Andre, personal finance blogger at VitalDollar.com. “Some of the offers (especially with Ibotta) will allow you to buy multiples of the same product and get the discount on each one (the offers will list a quantity limit). You can even stack these offers with sales and coupons from the grocery store. Apps like Ibotta, Basket, and Checkout 51 can help you save money on groceries for the party. “There are always a lot of sales before the Super Bowl, so if you’re able to stack a few of these offers, you could save quite a bit,” he adds. Check out Basket, too. This app allows you to punch in your entire grocery list, then comparison shop online stores and those in your area to see where you can get your items for the lowest price possible. Several credit cards offer a generous cash back reward rate when it comes to buying groceries. Plus, many are available with no annual fee. “This means that, so long as you pay off your statement balance in full before each due date, you’re paying less than the full price on your favorite Super Bowl foods,” says Sean Messier, a credit industry analyst with Credit Card Insider. Don’t wait until the last minute to figure out your menu. If you plan ahead of time, that will help slash the likelihood of impulse buys, and you’ll be better able to take advantage of sales, saving by ordering online, and coupons. Everybody has to have a place to sit. But if you don’t think you have enough seating, that doesn’t mean you have to go out and buy a bunch of chairs. “Make like your kids again and toss a bunch of blankets and pillows in the space between the TV and couch. … Otherwise, ask your neighbors to borrow some dining chairs and invite them over,” recommends Kristen Han, a certified financial planner with Millennial Estates Financial Group. It’s not a bad idea to ask a friend to co-host. You two can split the costs. And the two of you might have more resources so you don’t need to find additional chairs, for example. Pizza is an easy crowd pleaser that isn’t too expensive or tricky to make. If you want to stretch your dollar even further, buy deli pizzas from Sam’s Club or Costco. Then instead of cutting them in traditional triangle-shaped pieces, “party cut” them into small rectangles instead. If you order pizza, you can ask them to cut it in this manner, too, says Cherie Lowe, author of Slaying the Debt Dragon. By all means, set a budget. If you don’t have a firm idea of how much you plan to spend, you’re much more likely to have regrets after the game. Readers, how have you saved money when throwing Super Bowl parties — or parties in general? Share your tips in the comments below!